ARIADNE – the guiding thread through the labyrinth of telecommunications. Kornél Kedvessy, Marketing & Sales Director of FlexiTon, talks to InterComms about the company’s ARIADNE product. Q: Could you give me an overview of the company? A: FlexiTon Kft, a Finnish-Hungarian joint venture, was established in 1990. The company, registered in Budapest, is owned by a group of private individuals. The company is dedicated to deliver turnkey solutions based on the ARIADNE product family developed by FlexiTon for telecommunication network operators. (The name “ARIADNE” comes from Greek mythology). The ARIADNE product family is a powerful set of solutions for network operators to make it possible to manage large, complex telecom networks. Unlike most software houses, FlexiTon has also built-up a data engineering operation for high quality, large quantity data migration and production of digital maps, engineering documents and digital terrain models. For example, more than 7 million km2 of terrain, linear information, clutter, 3D building model databases from about 50 countries over five continents have been created for several clients including Nokia, Siemens, Vodafone, Pannon GSM, Westel, Nortel Networks, Istar, BKS and Infoterra. Q: What distinguishes you from others? A: We believe that FlexiTon has several strengths. These include our excellent reference sites, leading telecom operators, who have been happy customers of FlexiTon for years. Long-term customer satisfaction is the best marketing! There is no “box product” in this industry segment, so the success depends on how a project is organised and executed. We have over 1,000 man years of experience in telecoms management, so we speak their language and understand their problems. Therefore ARIADNE functionality provides solutions in full detail, it digs down to the root of the problems instead of only touching the problems on the surface. Our approach is professional, very flexible and customer focused. A key to the success is a powerful and easy to use graphical interface. We follow the engineers’ working practices; they prefer to work with graphical information rather than explore figures and tables. And finally the client can get a one-vendor solution for the software, data migration and project services during the execution of the project and after that. We’ve seen lot of unsuccessful projects due to vendors finger-pointing to each other. Q: Could you give me an overview of the ARIADNE product line? ARIADNE/MNM covers the network inventory and transmission planning of Mobile Telecom Networks. 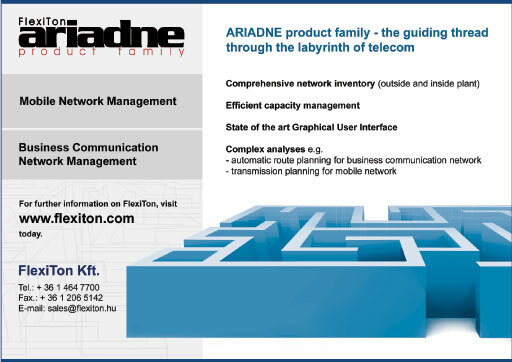 ARIADNE/TNM provides the network inventory and capacity management of a business communication network. (Outside & inside plant). ARIADNE/ANM covers network records tasks of access and terminal networks. ARIADNE/NMT supports the customer service and trouble ticketing workflow on the ARIADNE/ANM data. There are very few people in an organisation who create the data but a lot of them who use it. The web based solution for each of these products – ARIADNE/XXXi – allows the user to access the ARIADNE viewing and analysing functionality via a browser and in this way the information can be distributed in a very cost effective way within the company. Q: What type of user are you targeting and in which countries and regions? A: The typical potential users of the ARIADNE product family today are business communication and mobile telecom network operators. They have a requirement for; a comprehensive network inventory for both outside and inside plant; for efficient network capacity management; complex analysis capabilities, for example, automatic routing providing possible physical connections between two points of a business communication network; or transmission planning for a mobile environment. Our data services are delivered mainly to mobile and fixed line operators and big digital data provider organizations. Data services may be part of the ARIADNE project delivery or sold as an independent service. Q: What is the regional breakdown of customers? A: FlexiTon basically operates in the European market but we also have a customer in Japan. In Europe FlexiTon has customers in Hungary, Finland, England, Rep. of Ireland, N. Ireland, Italy, Spain, Portugal, France, Belgium, The Netherlands, Germany, Switzerland, Austria, Denmark, Sweden and Russia. ARIADNE product family members are used in more than 50 cities; for example in Amsterdam, Barcelona, Berlin, Brussels, Budapest, Cologne, Copenhagen, Dublin, Frankfurt, London, Madrid, Milan, München, Paris,Stuttgart, Tokyo, Valencia, Vienna and Zürich. The ARIADNE product family members are used by Colt Telecommunications, PanTel, Invitel (ex-UTI and ex-Vivendi Telecom Hungary), VW NB (ex KPN NB), Balatel and a telecom company in Japan. Q: What are the key benefits of the product to the user? The large-scale data migration (data audit) results in highly consistent & accurate data. All the information on the network and its associated assets are migrated into a single database.Implementation of the systems removes dependency within a company. Over- reliance on a small group of people can create serious problems when they are ill, unavailable or leave the company. When a system includes all the critical and relevant information this dependency is minimal.Quick access to time critical data results in faster response times. When a problem occurs the maintenance staff know exactly where it is, what elements are involved and which customers are affected.The time and resources required for network planning, network records and network management activities are significantly reduced by using ARIADNE.Overall we believe that companies, who implement ARIADNE, see a return on their investment in six to twelve months. Q: What do you estimate the savings that companies using your services have made? A: This type of information is normally not published by the companies. However, COLT for example, claimed in an article in the December 2003 issue of Geo:connexion that the implementation of ARIADNE resulted in annual savings in the region of £1.5m. Using ARIADNE, there are direct and indirect savings in a number of areas; staff reduction or re-allocation, maintenance cost saving, quicker response time to customers (resulting in winning more subscribers), more optimal use of existing network resources, higher quality service resulting in fewer SLA penalty payments and rapid and more accurate planning and decision making, to name a few. Q: How does the system differ between the solutions you offer for business communications, PSTN and GSM/UMTS/GPRS? A: The ARIADNE family members are built on one solid infrastructure that includes the sophisticated data model, the graphical user interface, map management and basic functionality such as locate, address management, search engine, etc. All the family members provide an end-user solution (even though customisation is always needed) to the network operator covering in a detailed and deep manner; network inventory, capacity management, planning, marketing support, workflow and in some cases even customer service and trouble ticketing. Q: What measures are you taking to ensure that the man-machine interface is easy to use? A: As I mentioned ARIADNE implements the methodology used by an engineer. One drawing can represent more information than hundreds of figures in a table. ARIADNE takes a graphical view and drills down to specific detailed data without the need to switch tools or mindsets. Data from the database can be represented in a number of different ways: ‘on-the-fly’ generated intelligent schematics from the database; layouts or civil maps with database links supported by GIS functionality; and data sheets with a hierarchical information system with which the user can find any information starting from any data sheet. Wizards guide the users through the routine activities allowing them to concentrate on the engineering problem. Therefore it takes only a couple of days for an engineer to learn how to use the system. Q: How are you taking the product forward? What new functionality/releases do you plan in the near future? A: The products have been improving continuously. We listen to our clients carefully and market trends are followed. Based on this information there are several new releases and at least one new version annually. For example the UMTS technology will be incorporated in ARIADNE/MNM during 2004 and we are releasing several new device interfaces in ARIADNE/TNM this year. Q: What are the important issues for telecommunications in Hungary and/or the region and how is that influencing what you do? A: The telecom sector has been suffering deep crises for the last 2-3 years. Investments have been minimised and companies have reduced their operation costs, too. Service providers disappeared or merged and banks took over the control of the operation in many organizations. On one hand this has been a problem as companies have stopped spending on systems, especially after experiencing a lot of high value IT projects that failed. On the other hand those who wanted to survive were open to reasonable solutions that would make their operation more efficient if the ROI was achieved in a short time. It seems that the situation is now getting better. Companies are starting to recover gradually and are starting to be open for system implementations like ARIADNE again.